I thought you might be interested in what I found in the week's trip through the Ruhr. I talked with British and German officials as well as Communists, Democrats, and Nationalists. The rest of what is happening gets mixed into this report as well. The story can be told in statistics and government reports which are available to everyone. These figures make it complicated and of great interest to economists, bureaucrats, and civil servants. But in the twenty months since I was lasting places like Essen, Düsseldorf, and Bochum, the changes have been more basic. And no column of figures ever displayed a soul. The one thing that strikes you upon leaving Berlin is the apparent well-being of the Zone economy. The shops, where plaster is hardly dry, are jammed with everything from pot scrapers to furs. Jewelers are back in business with gems and gold and silver. In Berlin the major shopping places are antique stores—and junk heaps where desperate families trade the last of their valuables for marks. In the Zone, there are few "antique shops." Everything is new. Düsseldorf is rapidly reviving its chamber of commerce slogan, "The Paris of Germany." Prices are high and, for the luxury article, far out of reach of the ordinary laborer or wage earner. But there are plenty of people who can and do buy. This is the carpetbagger era of postwar Western Germany, and the carpetbaggers are plentiful. The traditional Pot Belly—that which caricaturists put on every German businessman—is definitely in the forefront of this specialized era. You do not find the carpetbagger in the working areas where men dig coal or make steel. But in the sleek cafes of Düsseldorf—and there was one which outdid anything you could find in New York—they jam the place. It is interesting to note that there were no Jews among this class that I met. There is still anti-Semitic feeling among Germans on this count, but the carpetbaggers I met were Aryan-plus. I mention it only because I want the refrain to be Wagnerian pure. The people, even the Communists who capitalize on their own misery, are well-shod, well-fed in basic food stuffs, and appear more confident than any people I have seen outside of the United States. This does not mean that there is not hardship. There is plenty. In housing there is an acute shortage, although it must be pointed out that the Germans themselves have made their greatest progress in commercial construction and not in housing. The food is good. One British official maintains that the food situation and calorie consumption is much better in the Ruhr than it is in England. I believe him. The men who are making the quick money are those who deal in contracts—the middle men who take orders, perform the service of locating the goods, then sell or buy at their own price. Lax policing of industry by the British or Americans or French make this a big business in Germany. The current scandal in illegal export of steel, ball bearings, and other finished steel products show tremendous German initiative in beating the occupation. The "beat the occupation" refrain has only in the past few months become a national, unofficial, and ever-present reality. It is not that Western occupation is so wrong or so bad that we have manufactured opposition in our own right, but the chain of circumstances bear it out. The East-West struggle has automatically settled, or so they think, great power on the Germans. The Pawn in this international chess game has assumed the powers of the Queen, or maybe the Knight, when you see the way the situation changes. The Soviet East has succeeded in alienating virtually every German on either side of the Elbe. But the Democratic West tries to rule and at the same time persuade. The persuadees see their position, and the rules become bargaining points. It displays a profound lack of unity and confidence by the harbingers of democracy. In this sense, the German uses the Russo-American struggle for his own ends. This is the surface impression. The basic struggles in Western Germany can be broken down into sociological, political, and economic detail. There is a healthy core of Germans who want political honesty and sociological democracy achieved by free and decent means. These people have the morality of a syphilitic—that this is the time their contaminations stop and they appreciate the help toward that end. They are the moralists. They do not recommend surgery. Sociological surgery is war. But they do respond to treatment of the right kind. The withered limb of democracy in Germany needs to exercise to restore itself and grow. It needs the fresh air of political freedom. Whether this is being provided by military governments is questionable. There has been a lot of talk about "nationalism" in Germany, about its resurgence and reestablishment. The first thing to admit is that there has never been anything but nationalism in Germany in the past two hundred years. It is no stronger in Germany now than it has become in America in the last two wars. In many ways, German nationalism in this post-Hitler era is much less than the same unreasonableness that passed for "Americanism" in the Thomas committee. But the unity of language and culture and geography cannot be overcome by an occupying power more than can the current of the Rhine flowing to the [illegible] Zoo. The Western military occupation condemnations of resurgent nationalism in Germany, as evidenced in the abortive Strasser movement and certain other political groups in Bavaria, are foolish. Again the Western powers find themselves in paradoxical positions. The greatest argument we present to the German is that communism will make Germany a Russian state and destroy Germany. At the same time we attack "nationalism" where we find it. The German is sensitive to this and uses his position with dexterity. A case in point is the recent hearings against the communists and the swath of recalcitrant German workers in the Ruhr. The British made a "you-can't-do-this-to-the-Empire" mistake. They arrested the three leading Ruhr communists—Max Reimann on charges he had threatened other Germans working with the occupation—the two others for holding a political meeting without permission of the military government. The Communists loved it. They got a million dollars in publicity, plus the label of being "good Germans," for fines that at this reading have totaled eight hundred marks. In the case of the dismantling of the Bochum Verein, the British found themselves up against a stone wall. The Bochum workers refused to dismantle. Deciding to bring in outside labor, the British military government collected some twenty-five men from nearby Essen and gave them an order for which they had to sign in receipt. Then, when seven walked off the job, they were thrown in court. The mistake was that if the British wanted to strong-arm Germans to work for them—which as conquerors they presumably could do under the occupation—they should have ordered Bochum laborers to do it. Not inveigle outsiders to risk their necks. What happened in the Ruhr is that the British have succeeded too well in bringing about a popular united front against their occupation. Curiously, this united front consists of communists, industrialists, the center political parties, the labor unions, and every other German in the region. There is no middle class in the Ruhr as we know it in America. The white collar class as yet has no shirt. The bureaucrats, as set up by the military governments, have no solid self-identification. But the biggest chameleon of any group in the Ruhr are the industrialists. I talked with two top flight industrialists and almost found myself backing out of their offices. My back felt that vulnerable. Hermann Bausch, general manager of the Gutehoffnungshuette steel plant (formerly and probably still a cartel), outlined a gigantic plan of Ruhr power which, according to him, was to have the financial backing of the Belgian financial organization known as Sofina. Reusch didn't talk in terms of Germany or of political goals or world peace. He talked of producing coal and steel and making money. My impression was that it made no difference whether the money was marks, francs, dollars, pesetas, or rubles. In Frankfurt we also dug up another questionable character who looks like becoming one of the biggest financial wheels in Germany. His name is Dr. Hermann Bücher, former president of the Bewag (power monopoly) in Berlin, member of the board of directors of Sofina, and friend of many American financiers in America, he says. Bücher by his own admission has not been cleared politically by the British in whose zone he first tried to operate. He says he was not a Nazi and is classified by the British as a "dangerous character." So Bücher moved to the American zone. He is the author of the Ruhr power plan and showed us the details which include the number of feet of copper wire, bricks, and nuts and bolts needed. There is no doubt that the good doctor is a talented and ambitious man. His plan, briefly, would be to set up a series of some twenty-five new power plants throughout the Ruhr valley, establish its own grid system, raise the power up to prewar capacity—with the possibility of expansion. It is unique in that each power plant would be near a producing coal mine, and that the new plants would use low-grade, high ballast hard coal usually unshippable. This grid would provide any surplus of power not needed by Germany be sold to Switzerland, France, and the lowlands. It has the additional advantage of replacing depleting water power in the south of Germany. Bücher also points out that the present brown-coal fields on the left bank of the Ruhr will be depleted in fifteen years, and this will fill the gap. In other words, the Ruhr industrialists are already thinking in terms of ten to fifteen years ahead—in terms of international finance and, if you like, cartel and monopoly. Because the new grid would be nothing but that. But unlike the British who would have nothing to do with Bücher, the American military government is in close contact with him, and at this writing has authorized him to go ahead with his project—even to raising the billion and a half marks needed. Bücher admits that he needs foreign capital. He scoffed at the idea that Sofina would have the required amount. "The only export capital available exists in one country: the United States," he asserts. Bücher says that even this capital right now is unobtainable. Bücher said that to get the required foreign capital there is but one requirement: "The prospect of ten years of peace." The present world situation does not offer enough favorable prospects to make the risk worth taking. His other argument is that this power system will operate outside the Marshall Plan. "I offer amortization and interest. The American taxpayer pays nothing." Bücher told us on January 22 that he already knows that American capital is interested in his project. The plan does most certainly have appeal to the Americans because of its self-liquidating goals. The questions that arose in my mind, however, were these: At a time when the American government is attempting to establish a cooperative and unified European Recovery Plan based on American taxes, it is wise to authorize an independent power venture at the same time, which would involve American private capital taking investment profits out of the Europe which America is trying to rebuild by outright gift—a power venture whose profits incidentally depends upon the success of the American taxes now being "risked." Secondly, the British and most certainly the French view this project with extreme suspicion. Whatever their motives, is the risk of political estrangement over this matter worth the income promised by the Ruhr industrialists? Thirdly, the Europeans still regard over-development of the Ruhr as the first step to recreating the German menace. According to a responsible British economist with whom I talked, this plan follows the pattern of post-World War I. "Rehabilitate them economically first and political rehabilitation in the same old pattern will follow." It is something to think about. I dwell on the Bücher plan only because I think we will hear more about it. And because it worries me. From everyone I have talked with I understand that the level of industry will be raised to something like 14 million tons of steel yearly. This is deemed necessary to guarantee German participation in the European Recovery Plan. Incidentally, my industrialists say that Germany's requirements alone call for this figure. I think that the level of industry increase will go through. I spoke earlier of British and French suspicion. The French have the toughest attitude of all. They disapprove of the Ruhr as the Ruhr. Call it "Le Ruhr," okay. You don't have any of this trouble in the Saar. That's the French. The British find themselves in the same position to which we have elevated Western Germany. In Britain, it is export or die. In Germany, from the American point of view, it is export or the American taxpayer pays. That is basically the difficulty between John and Sam here. It is not unreasonable that the British and the French look with question on American proposals to raise the level of industry and take other action to stimulate Ruhr production. Both fear Germany as an enemy. But right now they fear her more as a competitor, particularly if American capital is going to enter the arena. With Britain, too, it is export or die. "If anyone is going to die in such a struggle," say the British, "It will not be the United Kingdom." It is an interesting fact that, when the victorious Allied armies entered Germany, it was the British who gained the reputation of being "soft." They often called us crude and hard. Now the position appears to be reversed. But it is the British government policy that "one of the fruits of war is foreign trade." The British are already bitter over the high standard of groceries that the Germans are getting is better than in England. They admit that the British housing standard is better. They are about even on clothing. But if Germany emerges with a better standard of living that Britain, say our English cousins, who won? The American military government is not being much help these days in answering these questions. Neither is Mr. Hoffmann or anyone else from the United States. The British, the French, and Benelux countries are in the position of poor relations. The postwar world is not so brave as it is dollarless. It is oversimplification to say it, but I would compare postwar Europe with a situation where a half-dozen artists try to paint a picture at the same time. None at this moment agree upon color, perspective, or form. In the case of one, there is even disagreement on whether it should be tempera, oil, or perhaps a sculpted frieze. This is the American viewpoint. The European Recovery Plan was originally based on the revival of Western European economy. A vital part of that economy is the Ruhr with its concentration of coal, foundries, and finishing plants. From the American point of view, disregarding the larger political implications, the economic thing is to go ahead with revival of the Ruhr. In the long run this will put the European economy on its feet the fastest and the cheapest, so the argument goes. Also on our side is the Ruhr Statute which internationalizes the control of the area—although it has no effect on ownership. The subsidiary Military Security Board is to take care of the security angle, although it is never clear to me whether steel for, say, locomotives is "war steel" or "peace steel." The French particularly have been critical of what they call precipitous action in promulgating Law No. 75. This law returns German industry to German ownership and control. It is a smart law in that trustees will be set up to take over properties seized from convicted Nazis. 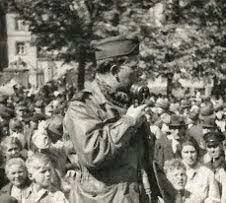 It is also smart in that, in the event of labor trouble, the military governments can turn negotiation over to Germans. The theory is that Germans will produce more and better working for Germans than for an occupier. Despite having gone along with it, the British are unhappy about the law because the matter of socialization was postponed. The American argument is that it is up to the German government of the future to decide that question. The British reply that this policy will encourage the reestablishment of the old order of Ruhr financial barons, and once they reestablish their hold it will never be relaxed. As it looks now, the mapmakers are going to have a job on their hands. Unless there is a radical change of policy in Moscow or Washington, it would be my guess that there will be two Germanys in Europe for quite some time to come. The proposed capitals may be Frankfurt and Leipzig. There are also some reports that the Russians will utilize East Berlin, which would be smart of them. What becomes of the blockade and our position here can be found out better in Washington than here. I don't know. At any rate, the Communists seem to be timing the creation of their East German state to come at approximately the time that the Western Powers announce the organization of a West German government. 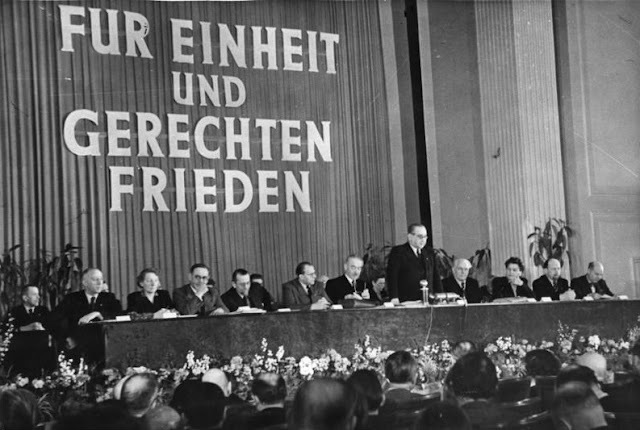 The creation of the East Berlin city government came only five days before the elections, and so may an East German government be established a few days before or after the Bonn decision. Dr. Konrad Adenauer, president of the Bonn constitutional convention, told me that the completion of the constitution and other government details may come in June, or more likely in July. 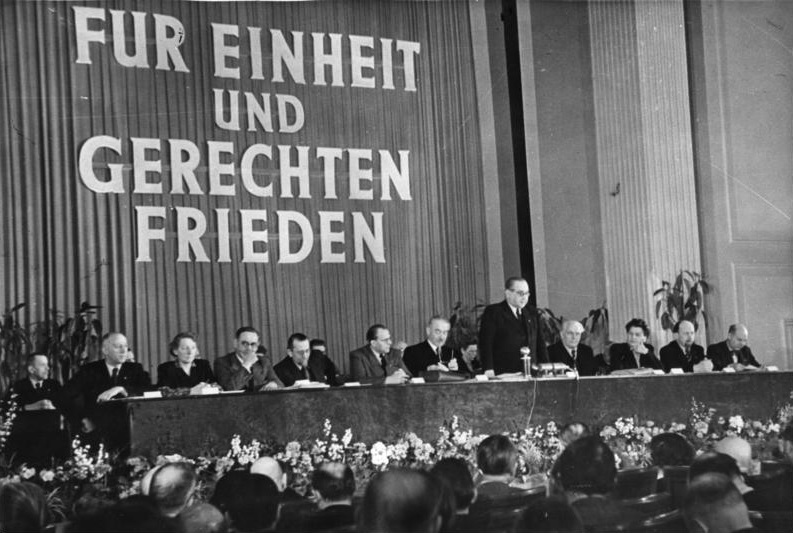 It is expected that, sometime in these months, the Socialist Unity Party—the Communist instrument of the East—will summon its much-postponed "People's Council for All Germany" and agree upon a government. They already have a constitution which has been drafted awaiting adoption. The newly appointed "politburo," as the Communist SED Party calls it, will form the government. In this respect, the German communists have outdone even the Russians. The Soviet government cut the "dictatorship of the proletariat" to thirteen men. The German politburo is only seven men. I am collecting biographies and other material on these men and suggest that they would make a good "Newsmakers" program. This has been a long and rambling report but I hope you find it useful. The coming spring is going to be of extreme importance. If we can get through the coming year and not have a war—and at least reach a stalemate settlement with the East—then we may have ten years of peace in which to work for world settlement. That is the feeling here, although the ten year figure is controversial. Sitting inside the Soviet circle, the psychological effect on reporters is one of claustrophobia and an increasing "who gives a damn" attitude. It is depressing, because you get the feeling that nothing has really changed. That the old forces which precipitated the last two wars are still at work, and that there is nothing much that can be done about it, and that the light of the UN is running out of the fuel of popular support.